Vermont-based Wood & Wood Inc. incorporates a mix of materials to create a themed desk for a client in the coffee business. Click here to browse photos documenting the process behind the final product. Sparky Potter (left), owner of Wood & Wood Inc., and Dan Cox, who commissioned the piece for his office at Coffee Enterprises, pose behind the finished product. The desk took its artistic inspiration as well as its materials from a wide variety of sources. Although Wood & Wood Inc. specializes in manufacturing and designing signs from its namesake material, the companyâs embrace of mixed media has helped keep customers flocking. Wood & Wood began in the early 1970s when Potter acquired a wood-burning kit and began recreating album covers with wood. His wife began selling the projects at craft-fairs, which lead to people taking notice of lettering on the wooden album covers. Sign commissions began coming in, and the company was born. The business, which has about nine full-time employees split between design and fabrication departments, specializes in signs, but it also fabricates a variety of custom furniture for the office and home. A custom desk for the president of Coffee Enterprises recently highlighted many of the companyâs strengths through a blend of mixed materials and artistic design that created a well-received project. 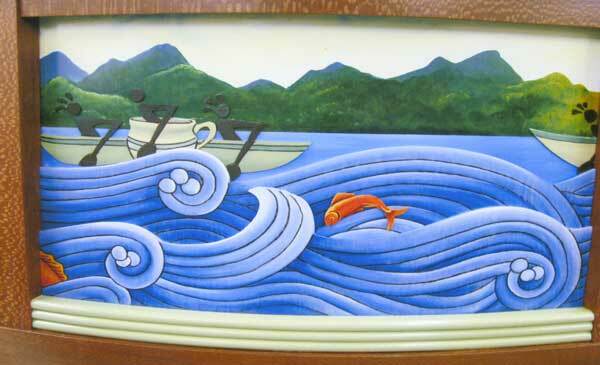 Each panel features a different season in the mountains behind the waves. All the desk panel art graphics were outlined with a wood burning tool and artistically painted. Click here to see photos documenting the progress of the panels. One of the first elements mentioned by the client was incorporating an old letterhead with characters rowing coffee cups. Next, Potter says he asked Cox about the deskâs location and realized it would be near a window overlooking a lake in the Adirondacks. After sketching the project, Wood & Wood built a mockup using Masonite and Styrofoam. With the mockup, the company realized artistically painted Wacky Board would work to create the waves and could be styled with wood burning. The background is Masonite because âit holds flex nicely and doesnât pucker up,â Potter says. The characters in the coffee cup boats are Â¼ inch maple veneer so they would hold their shape better than the Wacky Board, he adds. The Koi fish were cut from 1/8 inch aluminum and painted, and the desk was fabricated with Birdseye maple veneer over an MDF top with an orange leather writing area that pops out for easy replacement. It features cut out and curving lacewood supports, which matched cabinets already in the office, Potter says. âThe (desk) top was a chore. The top edge is unique, and we wanted to go in and put hardwood there, but the costs got out of control for something curved like that,â Potter says. Instead, the company used stacked MDF board with a birdseye maple veneer and routed the edge. "The veneer on top actually has a joint on the far left side. We created a spline of birdseye maple mixed with birdseye veneer,â he says. A photo of the desk in the dark. Wood & Wood installed red and white LED lights above the rowing coffee cup characters as a final creative touch. As a final touch, Potter says they decided to create a cavity to hold LED lights above the rowing characters. Both red and white lights were used, and the client can flip a switch to change colors to fit his mood. The desk features more than just looks, Potter adds. The desk was delivered in three pieces so it would fit through the officeâs doorway. The top was brought in as a big, fully-finished piece, while the two other pieces consisted of a three-or four-foot-long left hand section and the large curving area. Since its installation, the client has been pleased and Potter says he has even seen the deskâs popularity in action.